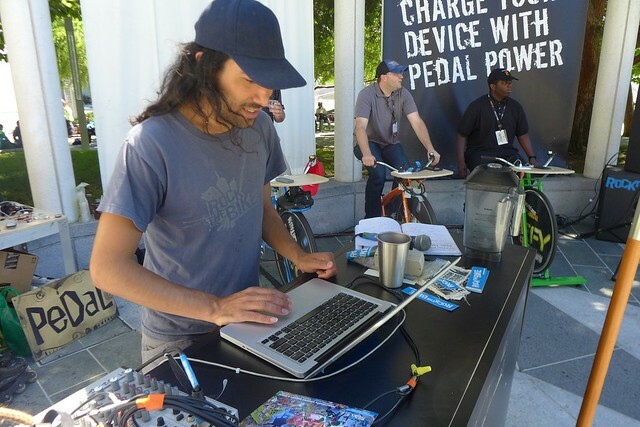 Rock The Bike produced a Pedal Powered Recharge Bar in San Francisco’s beautiful Yerba Buena Gardens for VM World, a major software conference. 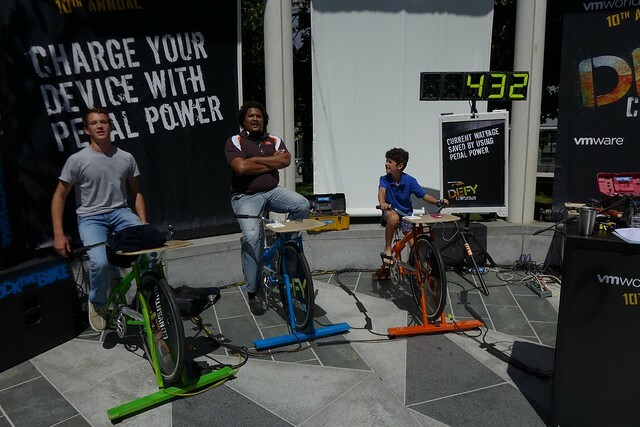 Over the course of the four days, conference attendees pedaled nearly 5 KiloWatt Hours (kWh) of energy as measured dynamically by the sign in the photo. 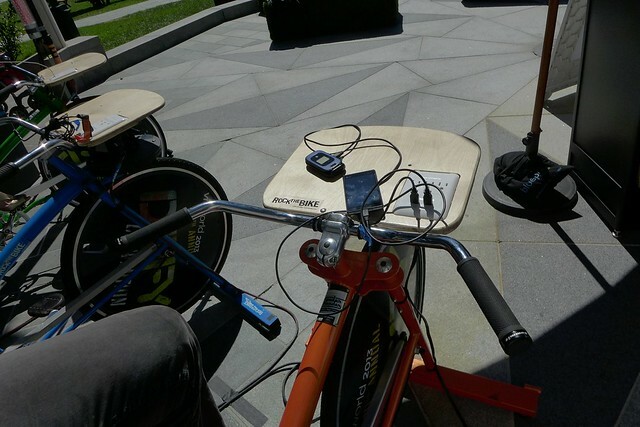 The main benefit of linking all the bikes together is that you can use the excess power to get music rocking across a large space. Excess power is from the fact that cell phones require only 5 Watts a piece to charge; an average adult can sustain 40-50W. So even if each person were to charge 2 phones each, there would still be 200 watts left over, enough for a really good sounding DJ Rig. 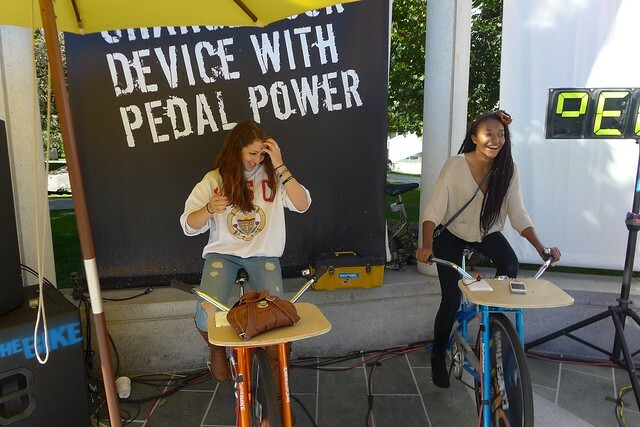 Each bike has a wooden surface where attendees can set their phone, iPad, a cup of water, bike blended smoothie, or a purse. To sustain our pedalers in the sun, we made sure to offer water. As you can see in this panorama, Yerba Buena Gardens is a fairly large space. I would estimate the capacity about 200-400 people. At different points in the week we would walk around the space to hear how the music sounded. Even out at the trees, past the tables and umbrellas brought in by conference organizers, the music was pleasant and present. Closer in, it sounded like a dance club. 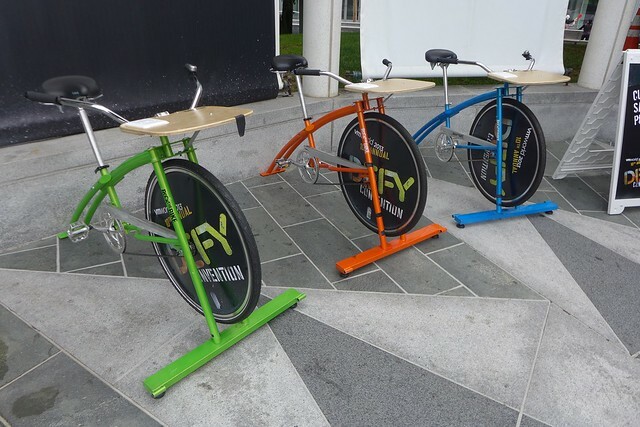 The volume changes when different combinations of people get on the bikes. If only 1 or 2 people pedal, we have to lower the sound and turn off the subwoofers. But if 4-6 people pedal, we can run the system at full volume. We brought in local guest DJs for each day’s lunchtime peak hour and had lots of compliments about the music. Above: DJ Huckleberry Spin. 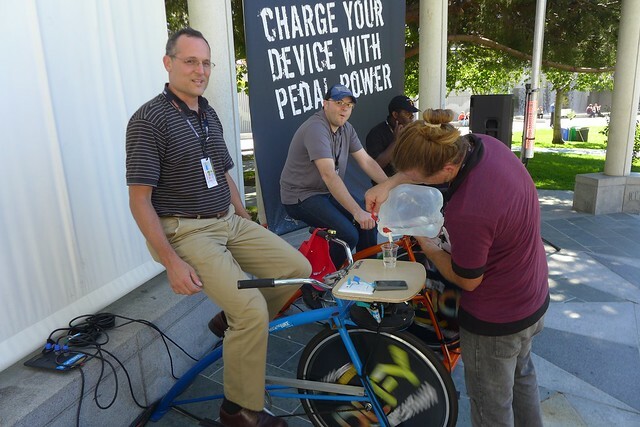 A lot of the pedalers at our conference didn’t want to charge anything. They just wanted to pedal. They were drawn in by the music and by our calls for new legs. Above, friends power the music together. We worked with the client to create branded Generator Pros. This is the same service we offer to our customers on their Fender Blender Pros. One of the ironies of working in Yerba Buena was that I’d been kicked out of the same space before for Soul Cycling (cruising with music). So having a permitted event in this garden was not lost on me. We lived it to the fullest, played our favorite music, and enjoyed the sunshine.